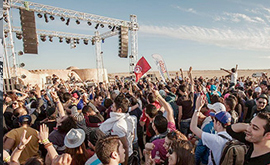 Choose Tunisia for your conferences and meetings for its exoticism and modernity. You’ll soon see that the facilities for hosting conferences have evolved, especially in terms of big name hotels. Conference centres, large rooms within hotels and traditional Berber tents can be found throughout the country. The “Parc des Expositions & International Commerce” in Le Kram is 8 minutes away from Tunis, set in 40 000 m2 of covered space with 3 halls of 4 000 to 10 000 m2. Multi-functional room of 5 000 m2. A prestigious venue set in one of the biggest Roman museums in the world. Several spaces are offered to events : welcome hall, special events with golden and sculptured ceiling, the Andalusian garden & a conference hall for 120 delegates. A space for 1 500 delegates, one for 500 delegates, 6 rooms for 20 to 50 delegates. 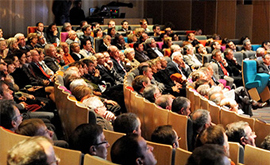 A the business area of Berges du Lac, a centre for 600 delegates and 4 rooms for 100-70 delegates.. Several hotels boast conference rooms up to 1 000 delegates. Several hotels have large conference rooms (up to 1000 people). This congress center boasts room facilities up to 2,500 delegates, several meeting rooms for exhibitions & events. It is self contained in the Yasmine Hammamet themed Medina Mediterranea. It boasts a conference room with a 700 seats capacity, with a first floor room accommodating 100 seats as well as several meeting & exhibition areas. It is part of a 3 hotels complex. The area is well adapted for large events with several venues accommodating more than 1 000 delegates. In Port El Kantaoui, El Mouradi Congress Centre boasts a conference room for 1 200 as well as 7 smaller rooms. In Djerba, Pasino Casino conference room will take up to 1 200 delegates. A dozen hotels offer high capacity conference rooms for 400-1 300. Luxurious caidal tents host events such as congresses or gala dinners. These huge sophisticated tents for special events/Gala Dinner will take up to 600 delegates.